The eleventh game of the year matches the Army West Point Black Knights (8-2, Sagarin 50) and the Football Championship Subdivision Patriot League Champion Colgate Raiders (6-0, 9-0 Sagarin 107). Army leads the all-time series 22-5-2. The series began in 1903 and all games have been played at West Point. Army has won the past five meetings, the last was a 35-27 Army victory in 1997. The Last Colgate win came in 1987, with a surprising 22-20 win over Jim Young’s Black Knights. Colgate enters the game ranked 6th in the FCS and prepares for the post season tournament. They really have nothing to lose other than the chance of injuries for their play-off run. Army enters the game on the cusp of top 25 rankings. An impressive win probably earns them a New Year’s Eve Bowl invitation and a top 25 ranking going into the Navy Game. Darnell Woolfolk scored two touchdowns and gained 69 yards on 12 carries as the Black Knights tamed the Leopards (3-7, 2-3) 31-13. Most of us were expecting a big first half from the Army offense and a second half filled with the names of freshmen and sophomores that we have sparingly seen this year. However, the Leopards stacked the box and limited Army to 5.5 yards per carry. The longest run was by Jordan Asberry for 30 yards. It was a class act by Brent Davis to call the majority of plays to the fullbacks and limit the ability for the Black Knights to run up the score. Kelvin Hopkins was 5/6 for 95 yards and could have easily passed for 300 if they made the effort. But this was a sure and steady effort that looked more like a practice. When Hopkins passed, he looked fantastic. The only incomplete pass, could have been caught by Calen Holt, but he seemed to have strained a muscle or hit an injured rib and could not hold onto the ball on the way to the ground. Credit the Leopards, they fought hard the entire game and they certainly outperformed most analysts’ expectations. On the day, Army gained 408 total yards (313 rushing/95 passing) and held onto the ball for 38:02. The Leopards forced another successful John Abercrombie field goal on Army’s first offensive drive thanks to a couple of false starts within the 10-yard line. Mike Reynolds had trouble with a punt return, which resulted in a Lafayette field goal. The Army defense was stellar, allowing only 159 total yards (83 rushing/76 passing). 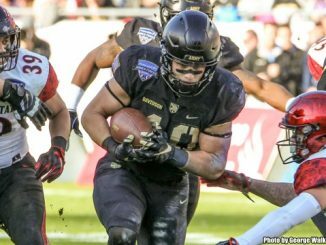 75 yards came on their final drive of the game when the Army second and third team was able to play. Leopard quarterback Sean O’Malley was 9/16 for 76 yards. Their leading rusher was C.J, Amil who ran for 43 yards on 12 carries. Cameron Jones and Cole Christiansen lead the team with five tackles each and the Leopards ran 40 total plays. Andy Davidson blocked a punt which led to a one play touchdown drive. 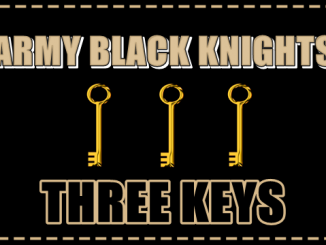 Overall, it was a sedated performance for the Black Knights, who were 45-point favorites. Army was a perfect host and made the game entertaining while limiting injuries. I have been to many Army money games over the years and greatly appreciated when the Power 5 teams showed Army such courtesy. They will need to be ready to play football this coming Saturday however. James Holland ran for 139 yards and three touchdowns on 20 carries as the Raiders downed the Mountain Hawks (2-8, 1-4) 48-6. The Raiders gained 459 total yards (313 rushing/146 passing) and held the ball for 37:13. Meanwhile, they limited the Mountain Hawks to 174 total yards. Sage Attwood was 8/14 for 146 yards and a touchdown. Thomas Ives caught two passes for 38 yards and a score. Seven different Raiders carried the ball, while five different Raiders had receptions. 52 of 68 plays were runs. Army is favored by 11 points. Colgate is a good football team. They are undefeated on the year. After two close games to open the year against Holy Cross and New Hampshire, they have outscored opponents in the last seven games 253-9. Their defense averages only 192 yards per game (57 rushing/ 135 passing.) They are outscoring opponents 67-0 in the first half and 195-9 in the first half. Things don’t sound so great for the Black Knights. However, Colgate has beaten up on the Patriot League as evidenced by their trouncing of the Leopards 45-0 earlier in the year. According to Sagarin Rating, Colgate’s strength of schedule is 32.73 (234 of 256), while Army’s is 62.63 (93 of 256). While their numbers could not be better, it would be hard to have worse competition. Army has played six undefeated teams this year and beaten four of them. 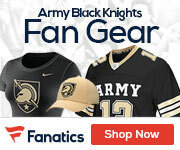 Army has beaten #96 Miami-Ohio, #85 Eastern Michigan, #77 Buffalo, and #75 Air Force. By straight Sagarin numbers, Army is a 13-point favorite. The Raider offensive line averages 290 lbs and their outstanding defensive line averages 280 lbs; they will give nothing up to Army. This team is as big as Army and a Lafayette like performance will not be successful. Colgate is having a dream season and will come to Michie fired up. Colgate will most likely stack the box and it will be interesting to see if Coach Davis chooses to run through it, around it or over it. Army should be able to move the ball, but Colgate will be very stingy if Army does not attempt a few passes. By the numbers, Colgate is better than Navy and everyone should treat this game as such. This is a team that physically matches up with Army and knows how to win. With both teams running the ball, the game could be limited to seven possessions and be over in 2:20. Barring turn overs and penalties from Army, they should prevail, but it will be close.